Venezuela recorded an important victory to strengthen their chances of qualifying for their first-ever World Cup. Cesar Farias made two changes from the side which lost 3-0 to Argentina. Cesar Gonzalez replaced Luis Seijas on the right, while Fernando Aristeguieta played upfront rather than Frank Feltscher. Mario Yepes was out, so Luis Perea came in at the back. Jose Pekerman pushed Juan Cuadrado forward to the right wing, with Juan Zuniga at right-back. Venezuela deserved this victory – they were forced to withstand pressure as Colombia dominated possession throughout, but the home side produced more goalscoring opportunities. Two very different systems were in operation here. Colombia were in a relatively straightforward 4-2-3-1 system, but Venezuela used the 4-2-2-2 that Farias has favoured over the past couple of seasons. 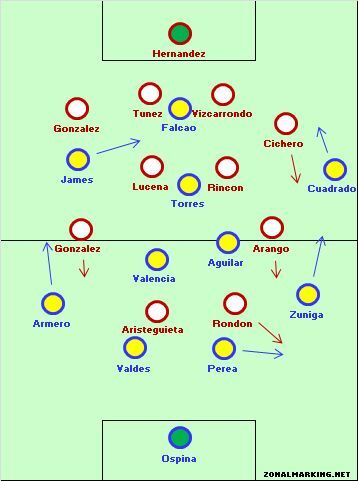 The obvious area of concern for Venezuela was in the centre of midfield, where Tomas Rincon and Franklin Lucena found themselves overrun by three Colombian midfielders, but although this contributed the away side dominating possession, Venezuela rarely found themselves drawn out of position. Pressing the ball high up the pitch would have allowed Macnelly Torres space between the lines, so the Venezuelan midfield duo sat deep, with the forward runs of Juan Arango and Cesar Gonzalez in central positions preventing Colombia’s double pivot from attacking too frequently. On paper, Venezuela’s strongest zone is down their left flank. Gabriel Cichero has been a consistently good attacking full-back for the last few years, playmaker Juan Arango has been superb for a considerable period of time, while Jose Rondon, on his day, is capable of outwitting top-class centre-backs. It was this area that Venezuela dominated in the first 10 minutes, and they eventually took the lead with a goal down that side. In the early stages, Cichero won his duel against Juan Cuadrado, getting forward on the overlap to put in a couple of decent crosses, while Arango found space in the gap between Cuadrado and Juan Zuniga. But the key was Rondon – as Zuniga moved up the pitch to attack (a key part of this Colombia system) Rondon pulled stand-in captain Luis Perea out towards the flank. Perea looked uncomfortable in that zone, and on the third occasion Rondon got one-against-one with him, from a clever Arango pass, he scored the game’s only goal. From then, the game changed. Venezuela had put good pressure upon the makeshift Colombian backline in the opening stages, but at 1-0 up they retreated and invited Colombian pressure. Gonzalez and Arango dropped back to become a second bank of four. Colombia rarely put together many good passing moves, however. The midfield duo were too static – Abel Aguilar got forward but rarely actually penetrated Venezuela’s midfield four, while Torres did a poor job of linking Falcao and the rest of the side. In fairness, he’d seemingly been told to knock the ball wide for Colombia to create 2 v 1 situations with the full-backs getting forward, before crossing towards Falacao. But the delivery from wide was disappointing, and too dependent upon Cuadrado (an inconsistent crosser, and losing his personal battle with Cichero). On the other side, James Rodriguez didn’t have anything like his best game, yet probably remained Colombia’s biggest threat – he drifted inside to become both an additional number nine, and an additional number ten, although his end product was underwhelming. The key to the game, however, was that even when pinned back inside their own half, Farias kept two strikers upfront. Rondon and Fernando Artisteguieta played their roles very cleverly – they were aware Colombia wanted to push both full-backs forward, and that the centre-backs were uncomfortable drifting out wide. Therefore, both focused upon working their own ‘channel’ – they rarely combined as a duo, but always offered a threat. Rondon was about movement and power, whereas Artisteguieta played more of a hold-up role. The key was not merely that Venezuela were trying to attack, but that this attacking forced Colombia to remain more cautious than they would have liked. With two outright forwards, and the centre-backs not comfortable enough to remain 2 v 2, Colombia didn’t know how to react. Did they keep one full-back in defence? Did they keep their holding midfielders in place? Ideally, they could have moved to a back three and pushed everyone else forward, but Pekerman never truly found an answer, and despite Colombia’s possession, they rarely managed to create overloads in the final third. Rather than substitutes changing the game, they simply made the game an exaggerated version of itself. Teofilo Gutierrez played Cuadrado’s role, was more attacking, but didn’t provide great service into the box. Carlos Bacca replaced Torres to become a second striker, but this didn’t solve the problem with a lack of service. Finally, Aldo Ramirez came on to drive forward at the Venezuelan defence, with Perea sacrificed and Valencia dropping in at the back, but Colombian never looked likely to get an equaliser. Jackson Martinez and Fredy Guarin surprisingly remained on the bench. In fact, Farias made the key change. Miku replaced Artisteguieta and was immediately involved in the action – whereas Artisteguieta was holding the ball up and waiting for support, Miku spun in behind more instinctively. He enjoyed three clear chances in his 25-minute spell on the pitch, which was probably more than Colombia managed in the 90 minutes. It seems an odd expression considering Venezuela’s lack of football history – they’re the only CONMEBOL country never to quality for the World Cup – but this was classic Venezuela. Farias’s 4-2-2-2 is solid in defence but excellent on the break – they showed that at the 2011 Copa America, on their way to the semi-finals, and in the 1-0 win over Argentina. 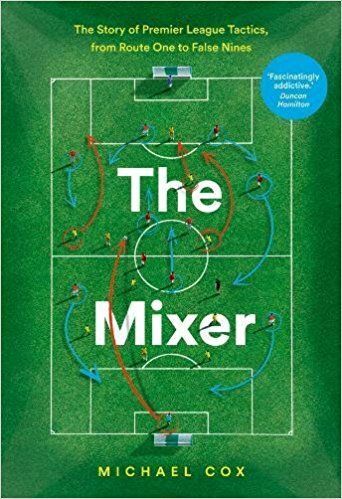 There’s a touch of the Zambia about them – cautious holding midfielders mixed with attack-minded wingers, two upfront and a determination to get the ball forward immediately. Colombia were hugely disappointing. They were too reliant upon Rodriguez for genuine creativity, and although there was a clear intention to get the full-backs forward and get crosses into Falcao, he had a frustrating evening. Pekerman’s inability to react to Venezuela’s counter-attacking threat meant Colombia wasted too many players in defensive positions – they simply didn’t do enough to score. Nobody calls him José Rondón do they? I’ve always used Salóman. Well, it’s Salomón, if we’re going to insist. Thanks, ZM, for the analysis, especially the discussion of Venezuela’s continued pressure up front. That really helps me understand why Colombia couldn’t move from its midfield dominance into quality attacking opportunities in the final third. Trusi knows what he’s talking about. Interesting to see this one, a key 3 points for Venezuela’s campaign. 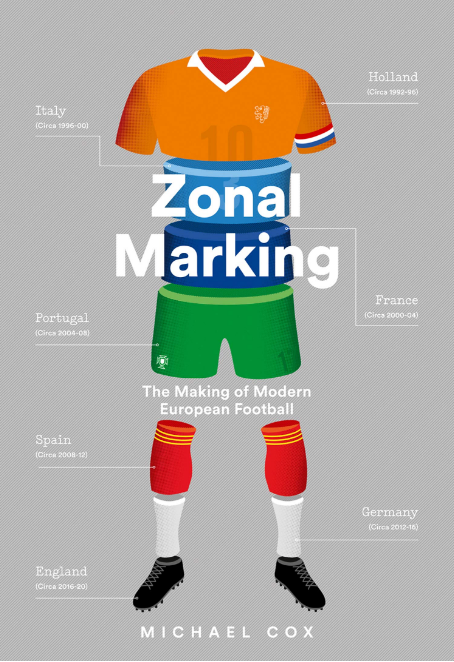 Just curious if you’ve ever been tempted to analyse any historical matches for kicks (that is, anything pre-2010)?